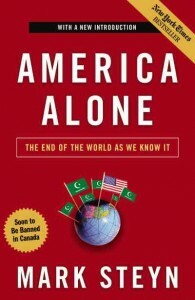 One book I’ve been wanting to read for a long time is Mark Steyn’s America Alone. Now, having read it, I have to say it exceeded my expectations. The subtitle is provocative: The End of the World As We Know It. His thesis is that most of the Western world is gradually submitting to Muslim sensitivities to the extent that Islamic culture and Sharia law will soon overtake nearly all Western European countries. When that happens, America will stand alone in opposition to this development. 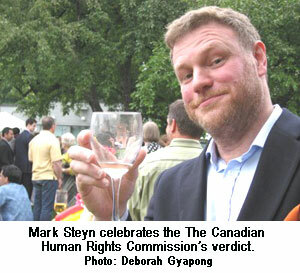 Steyn’s warnings led to his being hauled before a Canadian Human Rights Commission, accused of “hate speech.” He passed through the ordeal and was acquitted, but the experience only strengthens the argument of his book. The new edition has a tongue-in-cheek cover notification: “Soon to Be Banned in Canada.” It fits nicely with Steyn’s sense of humor, which makes the book a delight to read, even as you shudder at the implications of what he is revealing. Perhaps his warnings have had an influence on world leaders. Last week, both David Cameron of the United Kingdom and Nicolas Sarkozy of France declared that multiculturalism was a failed policy. They had been preceded in that view by Angela Merkel of Germany. All three pointed to the unworkability of separate cultures existing within the same nation. It remains to be seen, of course, if they will do anything more than talk, but even talk, at this point, is a relief. The critique has finally come out into the open in those very nations where the threat is greatest. 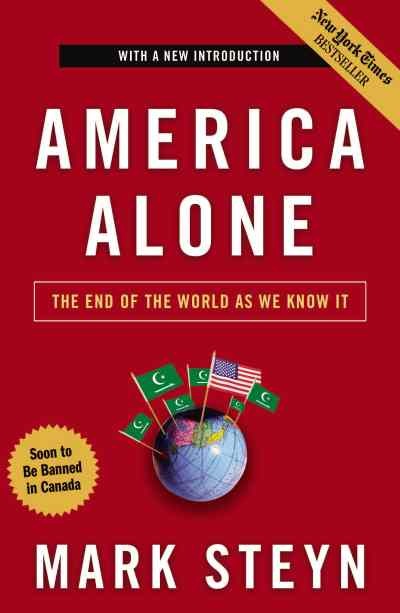 America Alone is so significant, and Steyn’s gift for poignant and simultaneously humorous explanations is so marvelous, that I intend to do a series based on the book and its observations. Today was an introduction. Keep alert for periodic installments.